Developed by Academy Award winner Kevin Costner, this is a magnificently produced, illustrative adventure story about a clandestine society of rogue voyagers on a mission to discover the mysteries that lie beyond the boundaries of the known world. Behind the staid public rooms of an old world gentlemen's club operates a more mysterious organization: The Explorers' Guild, a clandestine group of adventurers who bravely journey to those places in which light gives way to shadow and reason is usurped by myth. The secrets they seek are hidden in mountain ranges and lost in deserts, buried in the ocean floor and lodged deep in polar ice. The aim of The Explorers' Guild: to discover the mysteries that lie beyond the boundaries of the known world. Set against the backdrop of World War I, with Western Civilization on the edge of calamity, the first installment in The Explorers' Guild series, A Passage to Shambhala, concerns the Guild's quest to find the golden city of Buddhist myth. The search will take them from the Polar North to the Mongolian deserts, through the underground canals of Asia to deep inside the Himalayas, before the fabled city finally divulges its secrets and the globe-spanning journey plays out to its startling conclusion. 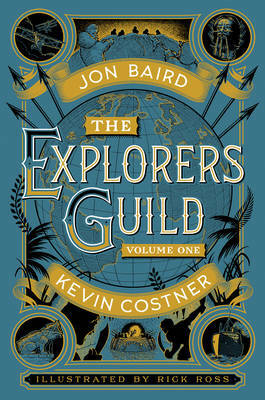 The Explorers' Guild is a rare publishing opportunity, powered by the creative passion of one of the world's true storytelling masters, Kevin Costner.